660LT MGB waste management bins from Moreno Global Plastics are compact units which are available in a choice of colours (conditions apply). These waste management bins may be personalised by hot stamping. This is an optional extra for those who wish to identify their binds with a logo or other marking. 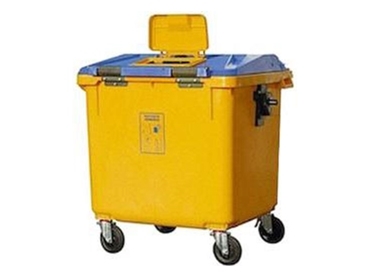 The outer dimensions of these waste management bins are 1360mm x 767mm x 1200mm. They weigh in at 44kg and they have a carrying capacity of 264 kg. Their volume is 660 litres. In addition, they feature Side Trunnions. Moreno are exclusive representatives of the internationally renowned Jco Plastic range.